Hip-hop fans take note, the RZA Chambers headphones from WeSC are now on offer over at Amazon for a reduced price of only £49.99, a saving of £200 on the MSRP, or 80 per cent for you percentage nuts out there. The headphones come with active noise cancellation, adjustable headband, a snazzy LED equalizer and easy-to-use on/off switch. They also come with a remote control, allowing you to control the volume and answer calls from supported devices. 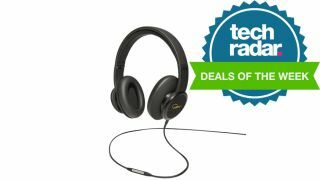 Editor Dan Grabham says: "These headphones feature active noise cancellation so they'll be great for use on a plane, train or another place where noise gets in the way of listening to your music. They'll also adjust to the shape of your head whatever its size or shape thanks to the adjustable headband, while cushioned earphones add to the comfort." Another good deal we thought was worth a mention this week is a saving of £100 on the 4TB Hitachi Touro Desktop Hard drive, now only £143.49. The 4TB capacity should provide enough storage to back up all your music, video and pictures, as well as your whole OS to boot. As ever, if you spot a deal you think people should know about then let us know in the comments.